TSM is at work on the M-11 highway connecting Moscow to Saint Petersburg, Russia, using a variety of GOMACO pavers for the project’s barrier wall. M-11 Moscow-Saint Petersburg Highway. Total length: 669 kilometers (416 mi). The highway is being constructed to ease traffic between Moscow and Saint Petersburg. The route bypasses all the major cities and towns. Transstroymekhanizatsiya (TSM) is one of the largest construction market players. Since 2006, TSM has been engaged in complex construction, renovation and repair of motor roads, airports, industrial and hydro-technical facilities. TSM is working on key road and airport construction projects. The company has such projects as M-4 “Don”, M-9 “Baltia” highways and Saint Petersburg Ring Road, airports in major Russian cities (Sheremetevo, Ufa, Khabarovsk, Gelenzhik, Sochi, Vladivostok) and many others in its portfolio. The company specializes in the construction of unique projects using innovative technologies. Meet Pavel Ulesov, TSM deputy director for airport construction. Pavel manages the company’s projects related to concrete construction. Pavel, it isn’t the first time we have had a conversation about the projects carried out by the TSM company with the use of GOMACO machines. What was your first encounter with GOMACO? This happened thanks to the late Vladimir Arutjunov, ex-general director of Centrdorstroy. He had been earnestly promoting the idea of concrete road construction since the nineties. That is why Centrdorstroy is one of the first road construction companies in the country that mastered new paving technology for concrete roads and airports. Some of their projects were the construction of the Moscow Ring Road, airport runways at the Domodedovo Moscow Airport, and other projects. However, the time came for a better method, one that provided higher quality and construction speed to replace outdated practices and manual labor in the sphere of concrete paving. I came across a GOMACO machine for the first time when I was acquiring a profession of electrical engineer in the institute of light industry. My father worked as a mechanical engineer in a concrete works company, where I started my career as a mechanic and followed in my father’s footsteps. When the purchase of new machines and concrete paving technologies became an issue, we had a choice from a few concrete paving machine suppliers. Having compared the benefits of the different models offered, we decided on GOMACO machines. What were the criteria of concrete paving machines choice? Why did you choose GOMACO? There were several factors. First, it has an enhanced mobility. The machines are more multi-functional from the point of view of paving widths and applications. For example, the Commander III is paving New Jersey barrier today, and the next day there is a need to slipform a curb or a flat slab. It takes us a couple of hours to mount another slipform mold as opposed to two to three days for a competitive machine. Furthermore, they sometimes need a different machine for certain applications. Secondly, among the wide range of models, we can choose the machine that exactly meets our needs. Such machines are easier to maintain in Russia’s conditions. High quality of service was also a must in making the final decision. We started using GOMACO machines on the M-4 Highway road paving project and then we paved aprons at the Domodedovo airport. We also paved there the first airport runway capable of accommodating large aircrafts such as the Airbus A380. TSM has a very large fleet of 41 units. TSM is a general contractor at the Moscow-St. Petersburg high-speed road construction project. What applications are they using their GOMACO machines for? The company is working across the entire length of the highway, thus our sites are situated throughout it. All the sites are interconnected. We are slipforming New Jersey barrier, curb and gutter, and a toll plaza. This is the first project for monolithic New Jersey construction in Russia. It is a time saving and cost effective technology. TSM chose GOMACO as their pavers of choice because of their versatility in slipforming a variety of applications and the ease in switching the pavers over from one application to another. Will you tell us more about the technology? The highway has always been a high-level danger area. Road accidents frequently happen because vehicles drive into the oncoming lane or off the driveway. The reasons are multiple: mechanical failures, glazed frost, decreased driver’s attention, and negligence in driving. Initially the project implied iron separators. However, TSM suggested New Jersey barrier as a better solution for two reasons: safety and cost. We carried out design works, crash tests, and concrete monolithic barrier was proven to be a more advantageous solution from the point of view of safety and cost. How are New Jersey barriers constructed? There is a specific technology that takes into account the following requirements: one-sided or double-sided product (for utilities, mostly for illumination), retention, reinforcement, total height, operational height. 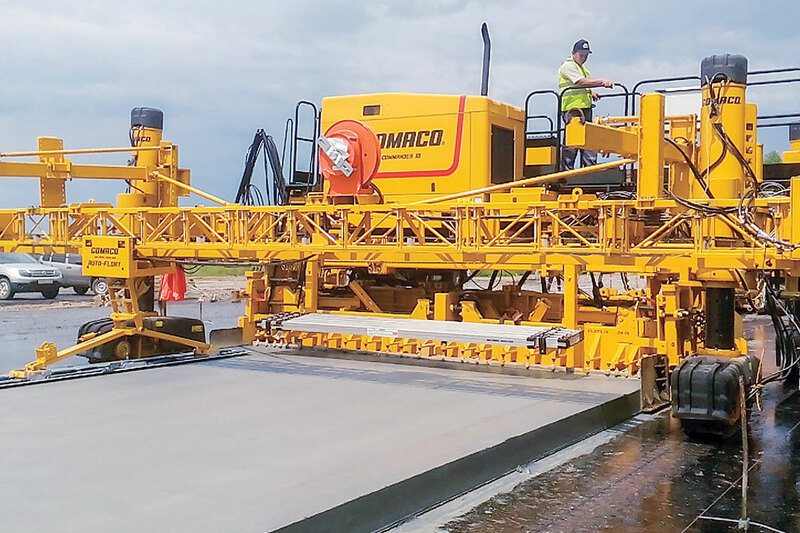 TSM is using three multipurpose GOMACO paver models, GT-3600, Commander III, and 4400 to pave the monolithic concrete barriers along the entire length of the project. How do you ensure a high quality of works performed? First of all, we always abide by technological documentation. The works are implemented at positive temperatures. The concrete has a water base, thus it’s impossible to work with it during the winter. Furthermore, we have multipurpose GOMACO machines that we have been using for about four years. The GOMACO machinery boasts a high level of accuracy (up to several millimeters) of works performed. We maintain the machines mostly on our own. We work during the daylight and set up lighting towers at night if there is a need. The TSM laboratory personnel and Rostest representatives control the constructed barrier quality. We also pay close attention to the qualifications of the specialists. I personally monitor the technical condition of the machines and the training of our employees. It is very important for me to make sure that all the operators clearly understand what they are doing in the workplace. I consult operators personally by phone and email. We arrange trainings, if necessary, and sometimes consult with our American colleagues. Alexey Ponomarev, who has joined GOMACO International Ltd. as a Sales Consultant, also added the following comments to the article. What is the function of safety barriers? The fact is that the majority of bad traffic accidents occurs as a result of the collision of vehicles moving in the wrong direction (head-on collision). Based on the experience of European and North American countries, the percentage of traffic accidents declines drastically, including casualties. The advantage of concrete monolithic barrier is its robustness. It is much higher than that of the metal counterpart due to several kilometers of one-piece construction. Moreover, we optimize our costs, because there is no need to repair the barrier. The next aspect is safety. What happens if a vehicle crashes into a concrete barrier? The main purpose of the barrier is to prevent driving into the oncoming lane in order to avoid the gravest consequences. Concrete barriers perform this task completely: it is impossible to break or damage it. Only a black impact print remains on the barrier. According to the results of numerous crash tests, monolithic concrete barrier of a certain form and size (GOMACO machines allow the construction of barriers of different forms and configuration) also helps to prevent an upturning of a vehicle. Rate of vehicle damage and casualty count are minimal and incomparable to the situations when collisions with steel barrier occurs. 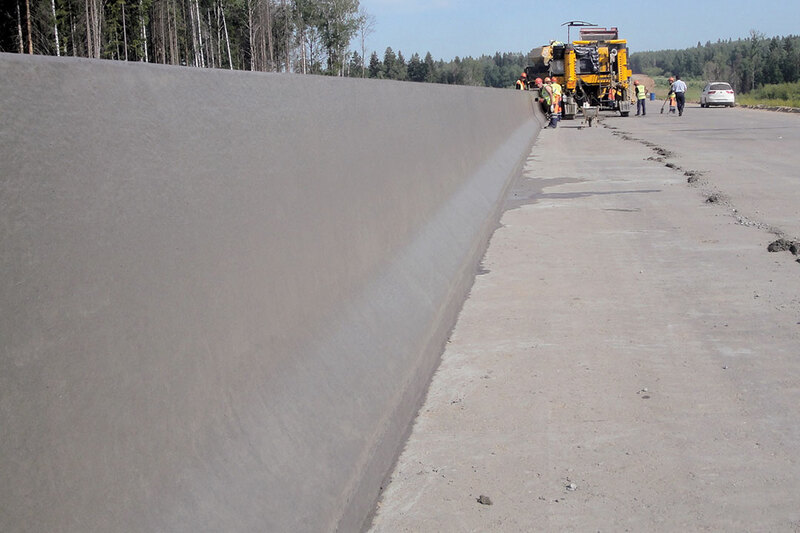 Why do we recommend using GOMACO machines for monolithic concrete barrier construction? First, the company provides a full line of machines for this application, including the GT-3600, Commander III, 3300, and 4400. Secondly, GOMACO offers supporting machines, concrete placers like the RTP-500 and 9500 to place the material. This is a second to none decision. Another benefit is GOMACO’s proven experience gained over the years slipforming New Jersey barrier.